There are a lot of reasons we are celebrating a decade of TRails to Empower Kids or TREK. We celebrate parents, teachers, tribal leaders, and everyone else in the communities who fulfill the country’s vision of empowered kids. We celebrate our volunteers who tirelessly and selflessly carry on this mission of helping kids who live in isolated communities. And we also celebrate our partnerships. I consider it one of God’s utmost blessings when our group finds like-minded organizations that not only bolster our efforts, but also inspire us. This blog post is my salute to the Aurora Offroaders, TRails to Empower Kids’ partner since 2009. Last week, we partnered again with the group for our outreach activity in San Luis, Aurora, the group’s home province. It was our 6th mission in a series of ten to celebrate our group’s 10th anniversary. Our beneficiaries were the students of Kalapnit Elementary School, which we first visited in 2009 alongside Aurora Offroaders. Our group had decided that we would celebrate this milestone by going back to ten of our partner communities. 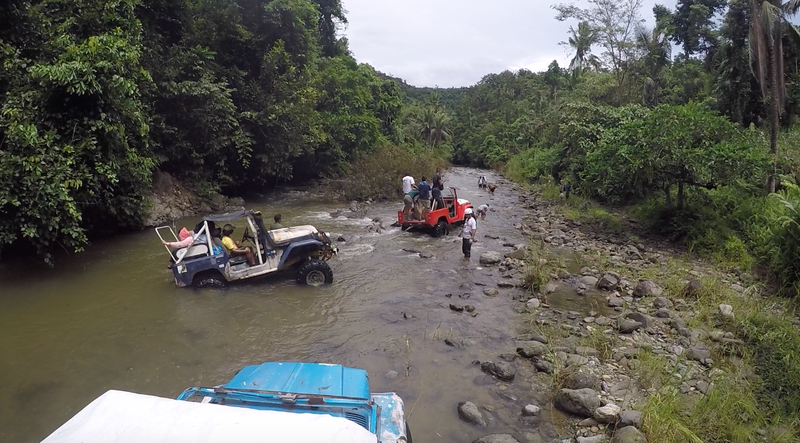 Because we'd been there before, we had an idea of the trail and we were a bit prepared for a long, bumpy, and adrenaline pumping ride to the jump-off point, which would be followed by a relaxing, short trek to the community - mostly river crossings. 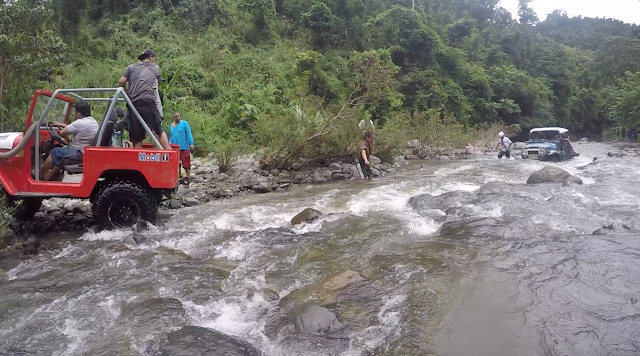 Well, our memories didn’t exactly serve us right, or maybe it was the incessant rains prior to our outreach, because the ride and trek took a lot longer. The trail was a lot more rugged than we remembered! And the action was much intense. 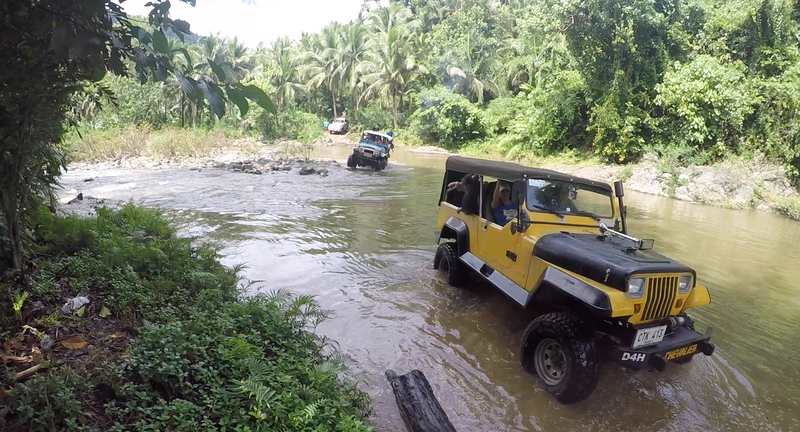 It once again tested Aurora Offroader Club’s mettle. There were cliffs, rocks, and lots of river crossings and group conquered them all. Vehicles got stuck in the river but Aurora Offroaders pulled them out almost like clockwork. The group also had to fix bogged-down machines onsite, MacGyver style. This team is composed of fathers and sons, brothers and cousins. 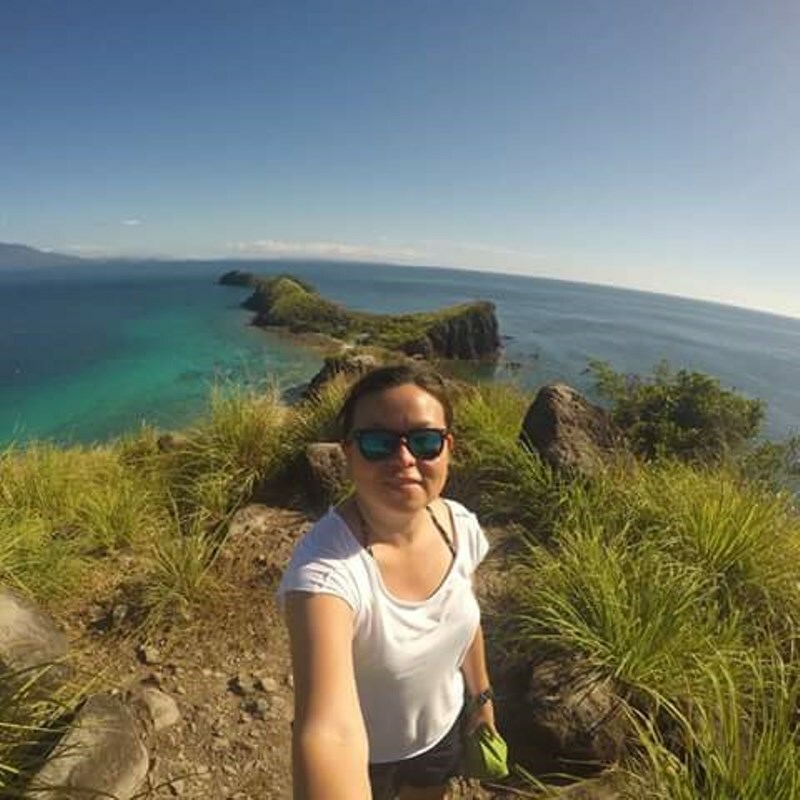 One of them is TRails to Empower Kids co-founder Noel Dulay. So, they are like our cousins. And, because they are family, we all felt safe and secured. I rode with Kuya Benedict, Noel’s older brother, in the back his truck. Kuya’s truck was one of the tougher ones. He assured us several times during the ride the truck would not topple over; we just had to hold on tight. I probably held on too tight, because afterwards my muscles were sore all over! Our truck was one of the vehicles that made it all the way to the jump-off point. Some had to stop midway and transfer loads. It took us around seven hours to get to the jump-off point, three hours longer than our projected time. Add to that the hike to the community, which took around an hour. That meant less time spent in the community, and we had to rush the whole program. We didn’t have any time to do the artworks and games, so we just had a simple handover of backpacks, school supplies, raincoats, hygiene kits, art sets, toys, and storybooks. The speeches were also short, but still very heartfelt. What we didn’t rush, though, was enjoying the feast the community had prepared for us! It started with pinakro, which was meant to be our snacks and is made of bananas, cassava, sticky rice, and coconut milk. This became the appetizer for our late lunch, wherein we had freshwater shrimps, taro dish, chicken soup, snails, and lots more. It was as memorable as the boodle fight the community prepared for us in 2009, one of my best TREK memories. At around 4PM, just after the kids finished their song, rain clouds hovered us and we had to rush down. It rained just as soon as I left the community and most of us were drenched. I was afraid the rain would continue and the rivers would swell. The weather forecast for that day was not good. We actually discussed several times the possibility of postponing the handover activities. But, until that time, we enjoyed good weather. We never actually thought we would have to apply sunscreen during our expedition! Good thing the rains stopped. 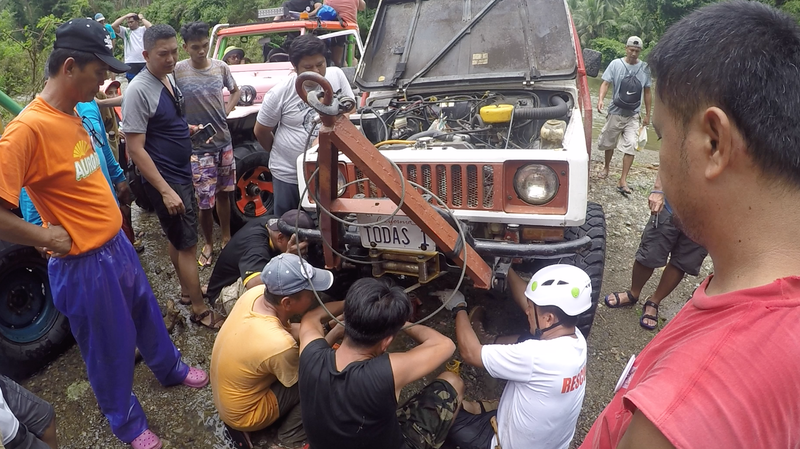 I couldn’t imagine how miserable it would have been when we had to stop for almost two hours for the repair of one of our volunteer’s vehicles. I remember one volunteer asking if some of the vehicles could already go ahead because there were kids. But, in a family, nobody leaves anyone behind and the Aurora Offroaders are our family. So, we all stayed and enjoyed the quiet night, lit up by a bonfire and a few fireflies beside us, and a thousand starts above us. 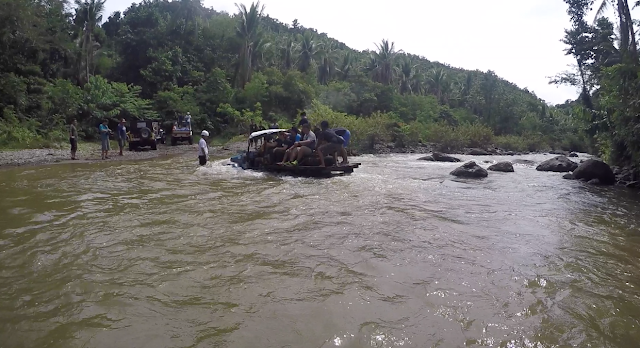 I sat in front of the vehicle (only in my bra because I was drying my clothes and the rest of my clothes were in another vehicle across the river), listening to our volunteers’ conversations and thinking how precious these moments are. I was not, even for a bit, frightened. I knew the Offroaders had our backs. Close to midnight, we were already back in front of the municipal hall of San Luis, where our trails to Kalapnit started, bidding our goodbyes and saying thank you to everyone who gave us another experience we would cherish forever, plus lots of videos and photos to post on our social networking sites, and lots of stories to share to our families and friends back home. We will be forever grateful to all the members of the Aurora Offroaders Club, and to all the drivers who expertly drove us through those rough terrains; to the rescuers led by Sir Allen, who was also our spotter, mechanic and medic (we doubt there is anything this guy cannot do); and everyone else in the support team. The outreach would not have been successful without their grit, comradeship, and grace under pressure!